The above info came from Paola Juarez and Michelle, and was edited by yours truly (contact me). The image came from Amazon. 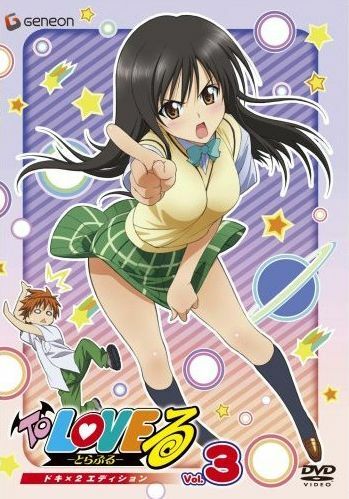 To Love-Ru is a anime and manga that tells the story of Rito Yuuki, a normal 15 (16 after his birthday) year old student who goes to high school along with his longtime love Haruna Sarenji, though whom he cannot confess his feelings towards. Another girl, Lala, then appears, trying to escape from her home and father due to that she doesn't want to marry any of her chosen fiances. She ends up in Rito's bathroom... naked. Rito freaks out, but then later on helps her escape and she then stays and lives with Rito. Lala stated that she loves Rito and wants to marry him, while Rito cannot do that due the fact that he is completely in love with Haruna. Haruna and Lala later become friends and Rito gets closer to Haruna thanks to that. Haruna shows similar affection for Rito and loves him back but she also cannot confess her feelings to Rito because of Lala. The above description came from Paola Juarez, and was edited by yours truly (contact me). The main character in this anime is Rito Yuuki. He is in love with Haruna Sarenji but he's too shy to confess to her and always fails. One day, while taking a bath, a naked girl popped out of his tube. That girl is Lala Satalin Deviluke. She comes from another planet. She then falls in love with Rito, who doesn't answer to her feelings. With her, they start the adventure of their lives. The above description came from Michelle, and was edited by yours truly (contact me).